NOTE: Before testing the sensor, check for HVAC DTCs (see page 21-101). 1. Remove the in-car temperature sensor (see page 21-184). 2. Test the in-car temperature sensor while holding it in front of the dashboard center vent. вЂў Measure the resistance with the system set to Max Cool. вЂў Measure the resistance with the system set to Max Hot. 3. 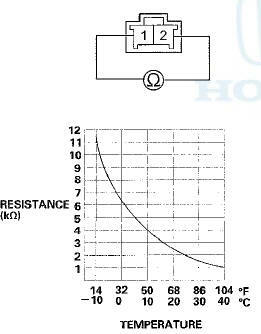 Compare the resistance reading between terminals No. 1 and No. 2 of the in-car temperature sensor with the specifications shown in the graph; the resistance should be within the specifications for whatever the ambient temperature is. 4. If the resistance is not as specified, replace the in-car temperature sensor (see page 21-184).